The 1873 Ordnance Survey map shows over 20 separate oyster layings at Paglesham East End along the river Roach and Paglesham Reach (strictly part of Hockley Parish). They were owned by individuals, partnerships and families but they were managed and farmed by ordinary villagers. Paglesham was a community built on farming the land and farming the tidal rivers. Oysters were a popular source of food from Roman times but in the 19th century the trade really took off. 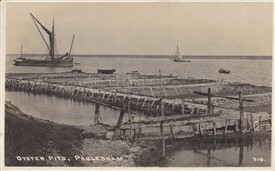 At that time oysters were a cheap food for the poor and by the beginning of the 20th century Paglesham's beds were producing half a million for market annually. They were sold locally and in London. 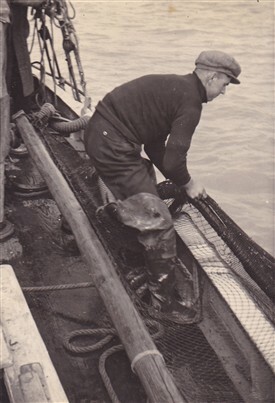 The oyster fishermen even sailed across the channel to deliver their produce to markets on the continent. There was always a barrel of fresh oysters on the bar of the Plough and Sail during the season. 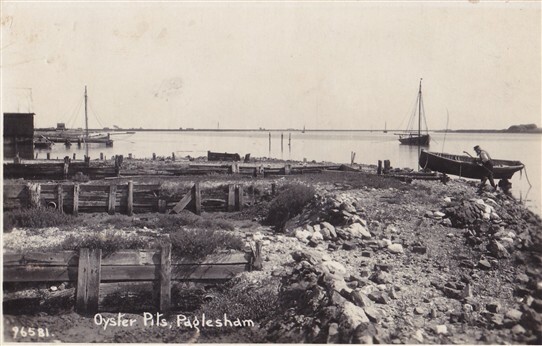 The heyday of the Paglesham oyster business was the last quarter of the 19th and first quarter of the 20th centuries. At that time the cottages known as Brick Row were built to house oystermen and farmworkers. These “two-up, two-down” cottages with an outside wash house, coal shed and board-and-bucket lavatory often housed familes of seven or eight people. The owners, however, lived in the substantial houses scattered around the area. 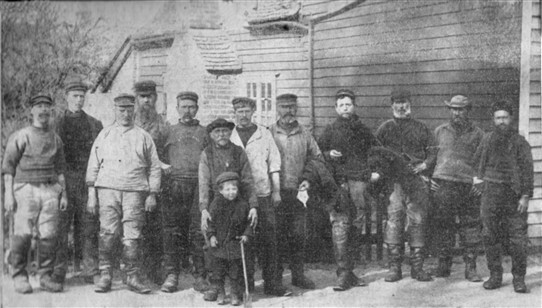 The oystermen worked according to the tides, leaving home with their thigh boots turned down so they could ride their bicyles and taking out the little sailing dinghies they used to sort and harvest the oysters in all weathers. But the oysters were to sell: the oystermen's families ate shrimps and herrings. Oysters need to be in constantly flowing water so they are laid at the low water mark where they can be covered and uncovered by the tides. 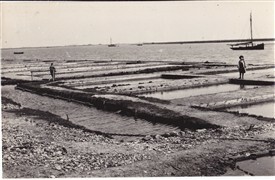 After three or four years the oysters were harvested and fattened for market in one of the 200 beds which once existed on the saltings. That was when they needed to be protected from thieves: watch houses were built on the marshes, often on stilts, and men were paid to keep guard all night, specially at weekends. Until the second world war dozens of Paglesham people were involved in the oyster trade but the floods of 1953 and successive hard winters, ending with the devastation of six solid weeks of frost and snow in early 1963, nearly finished off the business. 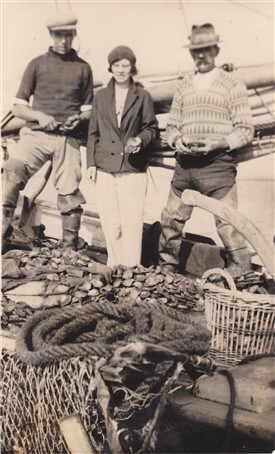 By 1969 the Keeble brothers, Hubert and Alf, were the only ones left tending the oysters. The beds were left to decay. Watch houses and worksheds fell down; the little oyster boats rotted at their moorings until, at the start of the 21st century, the promise of a luxury market in prime local oysters and a love of tradition inspired a new generation of young men to start up the trade again. This page was added by Sue Horncastle on 17/02/2013.